I have found the suitcase. 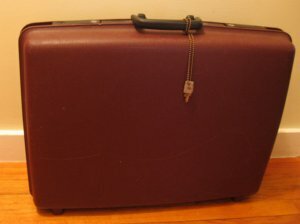 The suitcase that is sturdy, the suitcase that is cheap, the suitcase that is big enough to fit all my effects pedals. It’s not the old, beat up hard leather suitcase I had originally envisioned, but still, one does not argue with a $5.99 Samsonite, with lock and keys, from that great bastion of treasures called Goodwill. Now I just need to find my piece of plywood, speaker carpet, velcro and a method to latch the board into the case and prevent it from banging around inside. Another project for the summer. w00t.